I love to read and to think, but I’ve learned over the years that concepts and thought can only take you so far. Moreover, you just can’t believe whatever you read, or think either. But don’t take my word for it; check it out! Thoughts are a good servant but a poor master; the problem is that we are too often in their thrall. Awareness is far broader and deeper. Over twenty-five hundred years ago Buddha stated that anyone could become enlightened through applying his awareness-cultivation teachings. And many have reaped these blessed results — Buddhist and otherwise. This is the fundamental premise and promise of the Buddha’s path of awakening, an illumined life. Total awareness is enlightenment. We cultivate and develop this heightened awareness through remindfulness or remembering to remember: to recollect precisely what we’re doing in the present moment, as well as who and what we are. Not just self-consciously to remember yourself, but to remember to recollect ourselves and what we’re actually doing, here and now, as well as in the bigger picture. 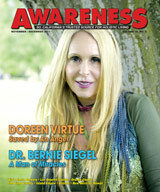 Awareness is the alpha and the omega of the spiritual path. Parroting prayers or mindlessly practicing yoga, bows, or genuflections, while you are distractedly thinking of other things, is not much better than a praying mantis rubbing its little hands together over its prey. Attention is the essence of the illumined life. This is precisely where the applied daily practice of mindfulness and present awareness, moment-to-moment sustained attention, proves invaluable. This effectively helps us to see deeper, live more closely aligned with our best selves and vital values, and catch ourselves and our priorities before other things catch us. How can we carry this holy fire down from the rarified Himalayan mountaintops and integrate transformative spirituality into our daily lives, here and now? This is the purpose of what I lovingly call Applied Buddhism, to actually implement these liberating tools and techniques into our modern lives through our own enlightenment day to day. Let’s consciously strive daily to bring the clear light of cosmic spirit into everyday life, in the form of Backyard Spirituality in all our relationships, at home, at work, in traffic and at play as well — for this is where the rubber really meets the road on the spiritual path. Remember to center in the holy moment right now, take a breath break, and sink your roots deep into the good earth of this miraculous moment and imbibe its nutritious, delectable essences, never taking it for granted even for a minute. In Buddhist lingo, awareness is all. Applying present awareness — AKA mindfulness, a lucid and nonjudgmental, objective presence of mind — to whatever arises in the body-mind field of consciousness, we learn to smell and even taste the juicy bait of sensual perceptions without necessarily reacting impetuously according to our habitual desires and swallowing the whole thing hook, line and sinker, thus being pulled out of our element and to our death, spiritually speaking. I call this living in Buddha Standard Time (BST), that great time zone of the Flow, the sacred zone, wholly now and in the timeless dimension which suffuses every moment of linear time, past, present and future. We overlook it at our peril. Hmmm… I advise we do well to ask ourselves: What are my priorities? And learn to make some time for yourself, however brief. I myself manage to remember to take a breath, a breather; Take a Breath Break, and enjoy a Moment of Mindfulness many times, even throughout a busy day. Present moment awareness is curative and the best natural medicine; it’s refreshing and rejuvenating as well as healing, harmonizing and wholifying. Let’s learn to consciously exploit our own inner natural resources for a change and enter the realm of life in Buddha Standard Time. Turn the spotlight, the searchlight, inwards. All we seek can be found within. “Everything must be meditated.” to quote the enlightened Gyalwang Drukpa Lama. Each moment can be a stepping stone to nirvana, heaven, the pure land or paradise, the higher ground within us all. Nirvana is right here in the here and now, in this very moment. Now is the only place to be. This is why I try to live in Buddha Standard Time, the holy and entirely Now. Here’s the secret: it’s not time we lack, but focus, awareness and priorities. Simply applying present awareness is a homey yet potent, panacean practice, good for every occasion, not unlike blue jeans. So, pay attention, it pays off! Beginning requires making a conscious effort to carry your mindful awareness practice into every activity; after a while, it starts to effortlessly carry you. Try practicing mindful eating, listening, walking, etc, along with mindfulness of bodily sensation and breath. This arm of our integrated mindfulness is the essence of Applied Buddhism. You can take this open secret to the bank or anywhere at all. This is the joy of meditation.